According to the Arabic-language news channel al-Manar, citing al-Ikhbariyah, the White Helmets group has been preparing for another provocation against the Syrian government. The White Helmets group, which claims to be an impartial humanitarian NGO saving lives in Syria, has reportedly distributed masks in Eastern Ghouta to protect civilians from a chemical gas attack. The group, also known as Syrian Civil Defense, has allegedly been creating a new plot to blame another chemical attack on the Syrian government, al-Manar reported. Last week the Russian center for Syrian reconciliation announced that it had received information from a local resident that Tahrir al-Sham (formerly Jabhat al-Nusra) terrorists and White Helmets were preparing to stage a provocation, involving the use of chemical weapons in Idlib in order to blame the government for the attack on civilians. "On the evening of February 12, the Russian center for reconciliation received a telephone call from the resident a settlement in the Idlib province, informing them about a forthcoming provocation, using poisonous chemicals, to air it on a foreign television channel. According to the person, on the afternoon of February 12, the al-Nusra Front militants delivered more than 20 bottles of chlorine and personal protective equipment on three cars," the Russian military stated. The center added that representatives of the White Helmets had conducted dress rehearsals of providing “first aid” and individual means of protection to ostensibly “affected local residents” by the poisoning. 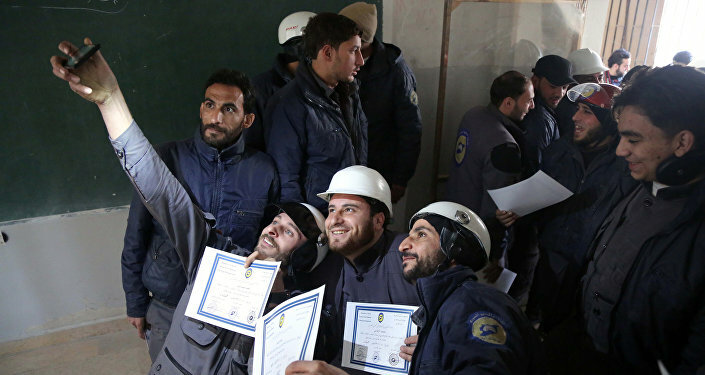 The White Helmets, which won an Oscar for Best Documentary Short showing its daily operations in 2017, has previously been accused of falsifying information about their work in Syria and staging “rescue” attempts in their videos for propaganda. The well-known footage, featuring a boy covered in ashes and injured in an alleged Russian Air Force strike on the militant-controlled Karm al-Qaterji neighborhood, appeared to be fake, too. Syria has repeatedly denied allegations of chemical weapons’ use, underscoring that it had no weapons of mass destruction, which was confirmed by the Organization for the Prohibition of Chemical Weapons (OPCW). On April 4, 2017, the National Coalition for Syrian Revolutionary and Opposition Forces, supported by the United States, accused Damascus of the Khan Sheikhoun incident in Idlib province, that left 80 people dead and injured 200 more. Western governments blamed Bashar al-Assad for being responsible for the use of sarin gas, an allegation he has firmly denied. Reacting to the incident, the United States, having no proof of the use of chemical weapons by Damascus, launched 59 Tomahawk cruise missiles at the Syrian government airfield in Ash Sha’irat on April 7.